I consider myself a fairly-plastic free person. I re-use shopping bags, I don’t eat processed food that comes in plastic packaging, I take a stainless steel water bottle with me when I’m out on the road, and I no longer accept disposable coffee cups when I’m grabbing a takeaway. Surprisingly, when I started to look deeper into my monthly habits, I had to admit that I was really only skimming the surface of being an environmentally good citizen. I realised that single-use plastic was in fact all around me, and it was horrifyingly obvious that I was chucking it away left right and centre and worst of all, not even noticing. This week I took a short haul flight where it was impossible to avoid the amount of single use plastic on the plane. I tried my best, naively praying that the plastic wrapper on my plastic pot with plastic cutlery in a plastic bag was going off to be responsibly disposed of. Unfortunately, I fear this may not have been the case. The worst culprits in my life seem to fall in the toiletries category. Daily contact lenses, cotton buds, toothbrush heads, lip balm and well, the entire contents of my makeup bag. Bin liners are challenging, ordering ANYTHING online or indeed sending it back, and what should I be using to tape wrapping paper for birthday presents these days? My immediate guilt was obvious and unavoidable. But then I realised, the point of #plasticfreeJuly is to not reprimand oneself for ‘failing’ to immediately cut all of these things out of your life. The point is to experience exactly this; becoming aware of your plastic footprint and one step at a time try to find alternatives where possible. They’re not always accessible, not always cheap, but by encouraging these changes and by becoming a conscious consumer, here’s hoping large companies, due to customer demand, will be forced into producing better alternatives which can be accessible and can be cheap. It was my birthday this month and all the people who really know me came up with some cracking gifts that they knew I would get excited about. 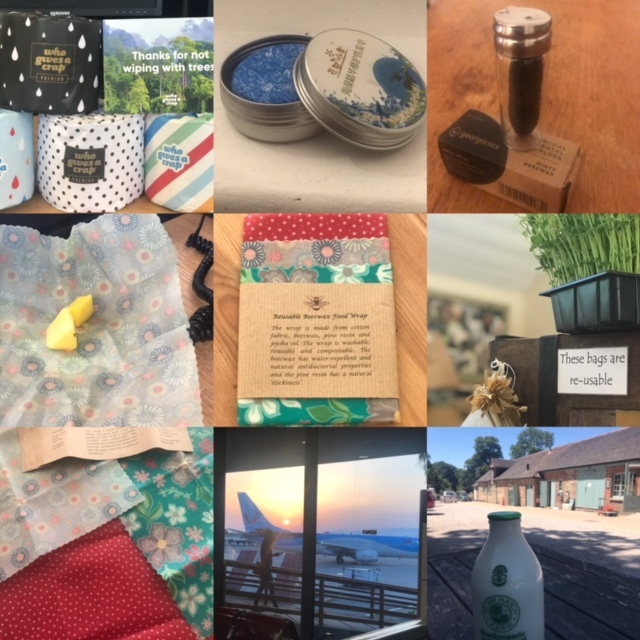 Sadly, charcoal dental floss in a glass jar with a stainless lid, a shampoo bar in a tin and beeswax food wraps were the highlight of the day – it doesn’t take much to please me! I’ve also taken a leaf out of the efforts in the Oyster office by ordering my own batch of plastic free packaging ‘Who gives a crap’ toilet paper, which donates 50% to building toilets in third world countries. 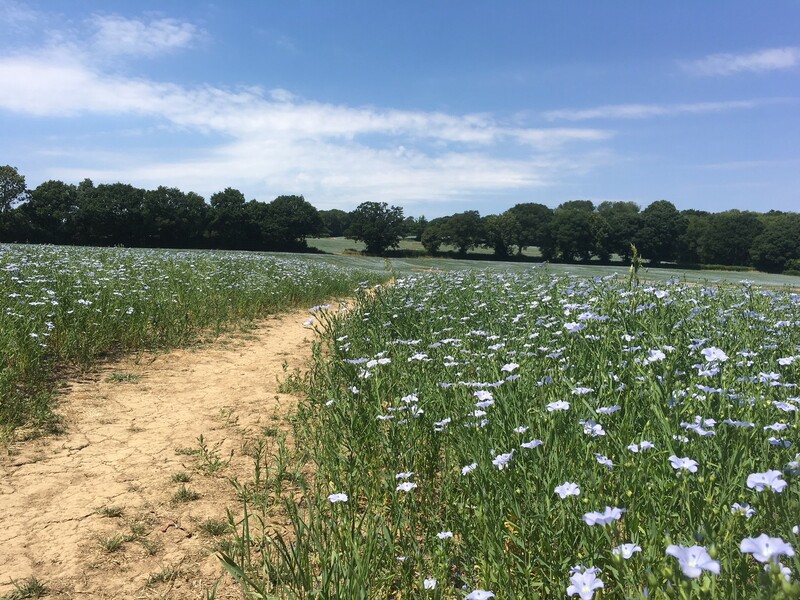 I have been visiting a local biodynamic farm who produce raw milk in glass bottles, offering a discount on your next bottle when you return a finished one. All purchases are handed back to you in cardboard boxes. I continue to use paper bags and bags for life, I’m wrapping fruit and lunch items in my beeswax paper, and I’m becoming more organised to avoid having to rely on food and beverages on the go. This isn’t a fad. Plastic is ruining our planet and if we don’t do something about it now then the damage will soon become irreversible. It won’t happen overnight but hopefully it’s the small steps that become big things ?. My plastic free journey started in 2016. This story starts, as all good stories do, with the purchase of a new bin. 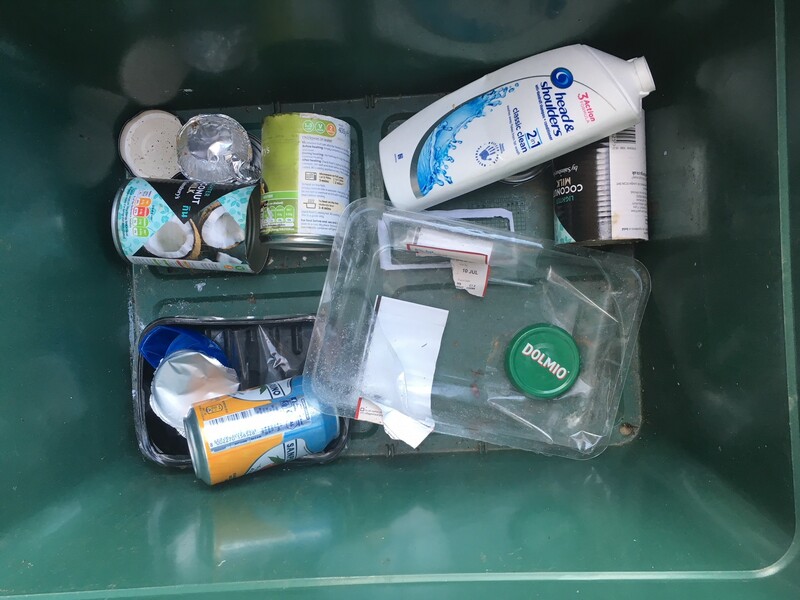 I feel that it is important to say that this was no ordinary bin – it had compartments for rubbish, glass recycling, cardboard recycling and plastic / tins recycling – and was designed to make my commitment to the environment more attractive and streamlined. The problem was, all the compartments were quite small, so I found myself constantly putting the bins out, overflowing with single use plastic. I decided that for my own sanity and for the sake of the environment, I had to reduce the amount of plastic in my life. Since 2016 I have stepped into supermarkets fewer times than I have fingers on my two hands. 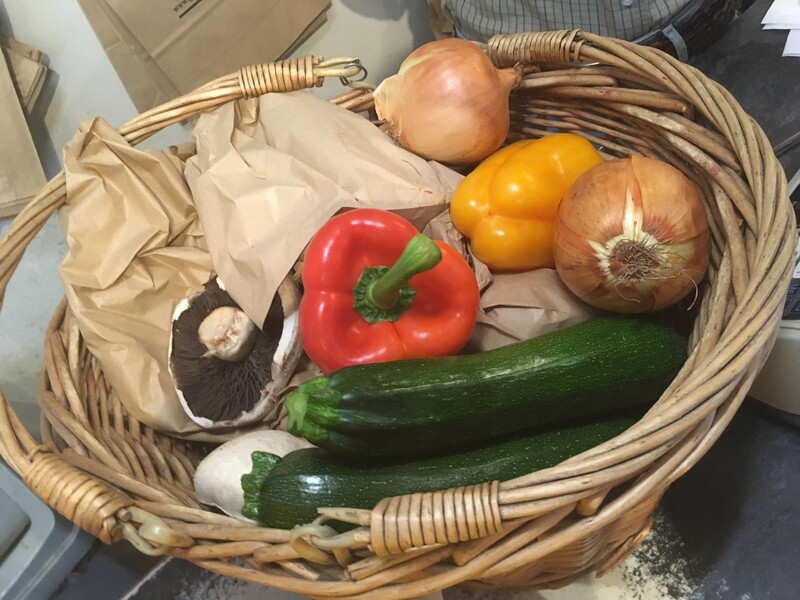 I do all shopping as locally as possible, in farm shops, butchers, greengrocers and bakeries. I get the basics ordered online and delivered to my front door. I have a compactible cup that I take everywhere for a cuppa on the go, and I always have a flask with me so that I can top up water when I need to. Not only has this meant that we have a much healthier diet, it has also meant that we are supporting locally sourced produce, we are saving money and we are leaving a smaller plastic footprint. Because of this, I thought that #plasticfreejuly would be a piece of cake. It has actually been much harder than I had initially thought. Since 2016 I have become immune to seeing plastic shampoo bottles, plastic wrappings around dishwasher tablets and the plastic tubes that my toothpaste is in, so convinced was I that I was living as plastic free as possible. Now I apologise to the planet every time I put the dishwasher on and do anything as outrageous as wash my hair. I was also distraught to find that my favourite clothes retailer packages their online purchases in enough packaging to sink a battleship. It’s baby steps, but we all have to start somewhere. Boosted by the efforts of our office to reduce plastic, I have tried to implement some of the changes in my day to day life. Some changes have been so easy – it’s hard to believe I haven’t done them before. Others required much more effort and organisation. Here are just two ways I have tried to contribute to the effort. Ordinarily on short city breaks, I rely on either buying little toiletries at the airport or using the shampoos supplied at hotels. This July, I actively thought about my packing – and didn’t leave it to last minute. I simply filled empty small bottles (used on a previous holiday) from the larger bottles in the shower. Although this change was nothing to get overly excited about – It made me realise how many of my decisions are driven by the desire for convenience. By just stopping to think for a few seconds, I was able to come up with a much more environmentally friendly solution. From small changes to much bigger ones, I have now started to avoid larger supermarkets. Once you start thinking about plastic, it’s incredible how hard it is to avoid. At the start of July, I walked into a supermarket and really struggled to avoid single use plastic – it was quite literally everywhere. From individual wrapped teabags in waxy paper to cucumbers wrapped in cling film, there were so many things that left me feeling confused. Plastic is not only used as a necessity, it is also use completely unnecessarily. I now head to my local farm shop for fruit and vegetables. Although it requires much more organisation, it is worth it and has decreased the plastic waste at my house. When faced with the prospect of having to avoid a punnet of strawberries, I was given a great tip – bring your own Tupperware box and pour them in. The biggest difference is that in my attempt to reduce my visits to the supermarket, I am now using everything in my house. I avoid throwing away anything and not only is this good for the environment, this is also great news for my finances! Overall, the experience has been educational and eye-opening. Although a completely plastic free existence is almost impossible today – I am optimistic that in the future, suppliers will use it more sparingly. Next Post Where to eat in Luang Prabang &#8211; for foodies! Previous Post Celebrations take place in London to raise money for our Brazilian project!